Queen Máxima of the Netherlands today revealed a ‘True Cost’ pineapple at the offices of Eosta, near Rotterdam, as part of a working visit to celebrate the company being named at the most sustainable in the country for 2018. 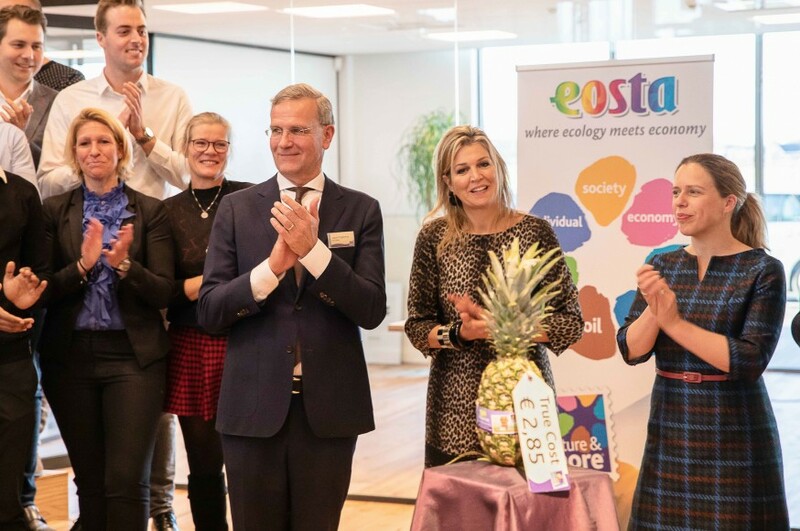 The ‘true cost’ reveal of the Nature & More pineapple was really €2.85, Eosta managing director Volkert Engelsman explained. For this price the pineapple can be grown sustainably, benefiting people and planet, instead of conventionally, passing on the hidden costs of production to future generations. The transition to an economy based on 'True Cost Accounting in Food Farming & Finance’ was further explored in a debate that followed, in which the queen actively participated. In the debate, the UN Sustainable Development Goals and the pathway to a new inclusive profit definition were discussed at length. "We are inevitably headed towards a new economy in which the hidden costs for people, the environment, and society – the so-called externalities – will be included in profit and loss accounts, as they should be," said Engelsman. "The challenge for science is to identify the actual costs, while it is up to the government to create a level playing field in the market that ensures polluters pay. The challenge for the business community is to free sustainability from the isolation of the staff departments and allow it to sink into the DNA of their profit and loss accounts." The international financial world is currently fully engaged in calculating hidden costs as a part of risk analysis, according to Klaas Knot of the DNB. Invested capital of €159bn will ‘evaporate’ when climate change measures such as a carbon tax are implemented, climate stress tests carried out at Dutch institutional investors revealed in October 2018. Thanks to this type of risk analysis, sustainability is becoming firmly rooted in the financial world. Engelsman added: ‘We should not only look at the numbers, but also beyond them. Ultimately, there is a question of purpose and meaning behind the way we structure our economy. What do we define as profit? What do we aim for as humanity? Once you start asking these questions, it becomes obvious that a vital ecosystem, a healthy population, and a humane society should also be considered as “profit”. An inclusive profit. That is the essence of the new economy we are moving to." In the debate, the 17 UN Sustainable Development Goals were used as a guideline for the design of the new economy. "We need a common objective in order to join forces," he added. "The 17 SDGs are embraced by the entire global community, a unique fact and a great opportunity."